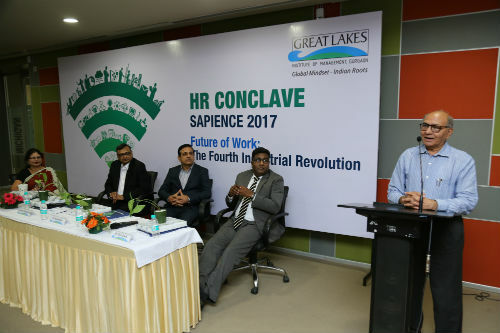 New Delhi : Great Lakes Institute of Management, Gurgaon, a premier B-school in the country, hosted SAPIENCE 2017 HR Conclave at its campus in Manesar. The Conclave was graced by the presence of Mr Pramod Sadarjoshi, Senior Director-HCM & Transformation, Asia-Pacific, ORACLE as the keynote speaker. 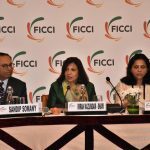 The theme of the HR Conclave was “The future of work in the fourth industrial revolution”. The Conclave witnessed 7 distinguished industry leaders discussing, how to face the challenges of a 24*7 work environment and how to leverage HR Analytics for optimizing organizational performance. Addressing the gathering, Dr. Himadri Das, Director, Great Lakes Institute of Management, Gurgaon, shared, “the role of HR is becoming more important and challenging today than it ever was, especially high quality intellectual capital HR. The growth of services has witnessed a move from blue collar to white collar. The challenges in white collar jobs are very different from the challenges of blue collar jobs and in a lot ways it is more challenging to maximize productivity of very high calibre intellectual white collar workforce across all the sectors and all geographies of the world. Thus, the theme of Sapience 2017 HR Conclave is very relevant in the current industry scenario”. The first panel discussed the topic – HR Challenges in 24/7 Work Environment. The panel comprised Mr. Mayank Arora, Vice President Sales HR, Mrs. Bector’s Cremica, Mr. Subhankar Ghose, Chief People Officer, Zoom Insurance Brokers, Pvt Ltd, Mr. Kunal Krishna, VP & Head HR, Lava International & Mr. Srinivas S, Partner and Leader, Mercer. The discussion revolved around the challenges that HR managers faced when they were to deal with circumstances pertaining to the requirement for 24*7 working environment with the added premise of different time zones, geographies and varied cultures. These challenges are – Growing Attrition rates, Shift timing roster differences for employees (with a highlight on female friendly work environments) along with importance given to the safety and security concerns .The Panel then discussed various methods and techniques for engaging with employees in such environments such as having video conferencing to avoid communication gaps, frequent Town hall meetings throughout all shifts to promote cross organisational interaction and conducting frequent employee training programmes. The panel raised the concern regarding knowing the employee progress on a frequent and individual basis in the 24*7 work environment and concluded that this can be solved with the use of analytics and machine learning algorithms. The second panel discussed the topic – Leveraging HR Analytics for Optimizing Organizational Performance. The panel consisted of Dr. Murli Padmanabhan, Sr. VP & Head Talent Management – Virtusa Polaris, Mr. Puneet Kalra, Managing Director, Russel Reynolds Associates, Mr. Alvin David, GM HR, Newgen software. The panelists said that huge amounts of Data is available on various social media platforms and today there are tools that can extract all the information about the particular candidate available on the web. The HR professionals today can gain from analytics largely and create strategies using sophisticated tools to Optimize organization performance, Use Predictive analysis for recruitment and attrition, Cognitive analysis for talent engagement and employment, Prescriptive analysis for learning and development. Further, the panel discussed the various challenges faced while implementing HR Analytics such as, firstly, Digital footprint –there is so much information available on social media that accurate interpretation of data is the biggest challenge, secondly, Investment – huge investment in market research and analytics is required and it is difficult to show ROI, thirdly, Dimension Predictability – it is difficult to judge from the data and predict the potential of the candidate and lastly, Cleansing of data – It is essential to change the raw data to usable form to carry out analysis. In the end, the panel opined that the world is complex and competitive, longevity of success has become shorter and organizations have turned agile. HR analytics is the only way to predict the future trends and requirements and have an optimally aligned workforce.